With nVotes, users can manage voter authentications through a variety of methods, included organizer-provided passwords, one-time passwords (OTPs) sent out by email, SMS, or postal mail, LDAP authentication, digital certificates and electronic identification cards. Two-factor authentication is supported, and multiple authentication methods can be offered, allowing voters to select which to use. Multi-factor authentication can also be set up on request. Open and closed census registries, and custom fields can be generated for each voter. nVotes ensures voter privacy through encryption of ballots within the web browser, preventing administrators from seeing any individual votes. Voters can also be allowed to change their vote after it is cast, with the aim of mitigating voter coercion. Cast-as-intended, recorded-as-cast, and counted-as-recorded verifiability ensure end-to-end verifiability of the voting system, preventing any ballot tampering. nVotes provides administrators with a public election events registry, and electronic election results certificates in PDF format. There are currently no reviews of nVotes Online Voting. Contact nVotes for full pricing information. • nVotes supports a range of voter authentication methods, including one-time passwords (OTPs) delivered by email, SMS, or postal mail, organizer-provided passwords, LDAP authentication, two-factor authentication methods, and more. • Voters can change their ballots once they have been cast, removing the opportunity for voter coercion. • Cast-as-intended, recorded-as-cast, and counted-as-recorded verifiability ensure end-to-end verifiability of the voting system, preventing any ballot tampering. • Election result certificates are generated in PDF format for any organizations requiring an official document to describe the election process. • Hybrid elections are supported, allowing users to combine online voting and paper ballots in a single election. Below are some frequently asked questions for nVotes Online Voting. Q. What type of pricing plans does nVotes Online Voting offer? Q. Who are the typical users of nVotes Online Voting? Q. What languages does nVotes Online Voting support? Q. Does nVotes Online Voting support mobile devices? Q. 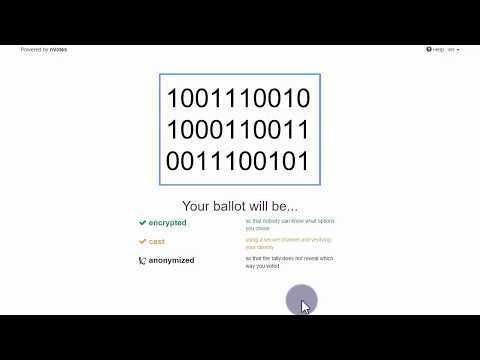 Does nVotes Online Voting offer an API? No, nVotes Online Voting does not have an API available. Q. What other apps does nVotes Online Voting integrate with? Q. What level of support does nVotes Online Voting offer?